Last weekend, I put forth the proposition that the short-lived Cleveland Indians “caveman” uniforms, worn only from 1973-1977, constituted their “signature” look (loosely, a signature look is one where if you were to see a picture of a player in that uniform set, you’d KNOW exactly what team you were looking at. It doesn’t need to be a team’s best looking uniform, or the one in which the team had its greatest success, or one which was worn the longest…just one you associate most strongly with a particular team.). Today, I’m taking a look at the Pittsburgh Pirates…and as you can glean from the photo above…I will argue the Pirates “signature” look is the “We Are Family” uniforms worn 1977 through 1979 (and technically through 1984). First off — no Pirates team (IMHO) can be considered to have a signature look before 1948, for it was in that year that the team took the momentous step and jettisoned their previous red and blue color schemes and adopted the iconic black and gold colors of the Pittsburgh flag. Beginning in 1948, and continuing until 1953, the Pirates adopted a uniform which is similar to their current set, featuring a black cap (with gold “P”) and “Pirates” across the chest, in “Pirate” script. Their roadies would say “PITTSBURGH”. In 1954, and until 1956, the Bucs would jettison the city-name-on-roads and wore “PIRATES” both home and away. Those were beautiful unis, no doubt — but what would follow could certainly be argued are the two other “signature” looks the team would have. Beginning in 1957, and until the team moved from Forbes Field to Three Rivers Stadium in 1970, the team wore vests with black sleeves and classic black stirrups with three gold stripes. It looked great on every player, but probably none more so than Roberto Clemente. In 1970, the Pirates moved (mid-season) into Three Rivers Stadium and with the move, they would begin wearing another semi-iconic uniform, lovingly dubbed “The Mustards” (for the distinct color of gold shade they wore). Not only was the uniform an MLB first (the beginning of the polyester era), it also was the first synthetic uniform to feature a sans-a-belt with pullover jersey. The Pirates would wear that uniform from mid-1970 through 1976 (and in 1976 they wore a mustard-colored “pillbox” cap that would become the basis for their “most” iconic and signature uniform — the “bumblebee” — but we’re getting slightly ahead of ourselves). From 1977-1979, the Pirates “broke” all uniform rules, introducing three complete uniforms (an all-gold, an all-black, and a white uniform with “fat” black and gold pinstripes, plus a black and gold pillbox cap, and both black and gold undershirts and stirrups). They would wear these uniforms in mix-and-match fashion, creating literally dozens of possible combinations. Almost no combination was off limits, but there was actually a “pattern” — if the team wore a black jersey, they wore gold sleeves and a gold cap; if they wore black pants, they’d wear gold stirrups (and vice-versa). Both the gold and black accessories were worn with the pinstripes. At this point, I’d like to direct your attention to two AMAZING posts I did with Jerry Wolper (“BucTracker”) with some assistance from a couple other UW stalwarts back in 2010 and 2011, wherein Jerry documented every combination worn by the Pirates from 1977 through 1984 (while the Pirates would continue to wear their gold and black uniforms through 1984, they would ditch the fat pins after 1979). It’s truly an amazing undertaking, and well worth reading through now, if you have a few extra minutes. As classic (even iconic) as those vested and mustard uniforms are, I think the evidence is clear the mix-and-match bumblebee era is THE signature uniform set for the Pirates. If that uniform set isn’t what one thinks of when one thinks “Pirates” — it’s up there. Couple all that with the “Stargell Stars” on their caps, and you have one memorable uniform. And for those who are fans…the 2016 Pirates will be bringing one of the combinations back (the black/gold/black/gold uniform worn in Game 7 of the 1979 World Series) for the Sunday home games this year. I will have a review of that, plus a look back at the many times the Pirates have attempted to throwback to the “We Are Family” uniforms in the past (and usually not well) soon. Once the calendar turned to 1985, the Pirates returned to a much more basic, and traditional, uniform scheme, and have continued that trend up to the present. The halcyon (and possibly psychadelic) days that produced the iconic mustard and bumblebee sets are gone…but not forgotten. So what say you readers, are the mix-and-match bumblebee uniforms the Pirates signature look? Just one colorization today — from another old friend from whom we have not heard in a long time —George Chilvers, who is back with one of his classic colorizations, and was spurred to send this in because of yesterday’s main article. Haven’t shared any with you for a while. People didn’t seem interested, so I haven’t bothered, but maybe (yester)day’s lede will get a bit of interest. This is the groundsman and his trusty friend preparing the pitch in 1925 at the Estadio Chamartin, which was then the ground of the now world-famous Real Madrid before they moved to the Estadio Bernabeu. Cue all sorts of jokes about the number of donkeys who are playing for whichever team at the moment. I will share with you though that I used to write quizzes for small groups (I don’t know if you have them over there – a “quiz night” with each table in a pub competing against everyone else). I once askeda question “who tilted at windmills?”. More than one group obviously had the person writing the answer mishearing the person who knew the answer – and wrote “Donkey Hotay”. Thanks George — great job, and welcome back! So glad to hear from you again! Just wanted to pass along my heartiest birthday wishes to Mr. Uni Watch, Paul Lukas, whose actual birthday is tomorrow. It always *seems* to rain on March 21, but we may end up with a bit of snow here in New York (that counts, right)? Either way, it looks like the day will start with some form of precipitation. And if you don’t know why that’s significant, I’m sure Paul will fill you in tomorrow. Paul and I usually exchange Amazon Gift Cards or something like Curling brooms or sweaters, but this year, in a great twist, he requested instead that I make a donation to the Southern Poverty Law Center in his name, and I heartily agreed. If you guys ever wanted to donate to a wonderful organization, this is a great one. So — Happy (early) Birthday to the best boss (and friend) a guy could ever ask for! Cheers buddy! Enjoy your special day tomorrow (the first full day of Spring). In case you missed it, Paul’s Friday Flashback on ESPN looked back at the (in)famous Marquette hoops untucked jerseys, which first appeared during the 1975-76 season. Not only were they a uniform *first* — they were also designed by forward Bo Ellis, a 6-foot-9 junior majoring in fashion design! The Marquette team already had worn some awesome designs during Coach Al McGuire’s tenure, but the untucked unis were another step in the evolution of uni design. We look back on them now with fondness (if not outright joy), but I’m wondering if swooshie or adidas came out with a similar “innovation” now if we’d simply pan them. Of course, uni design back then wasn’t done (or driven) by marketing considerations first and foremost — it was a different era. Baseball News: Will the new “flex base” side panels on jerseys affect teams wearing pinstripes? We thought so, but if you look at this ad from Dicks, it appears the “authentic” jersey will have normal pinstriping (and it does show the back hem in flex base material, so it does appear to be an “on field” type produce). Thanks to Joe Dixon. … The Scranton/Wilkes Barre RailRiders have unveiled a new blue alternate jersey. … Adam Vitcavage writes, “even my cup at Oakland’s Spring Training has logo/sponsor creep. Didn’t last year.” … The New Mexico Lobos debuted some very dark gray unis yesterday (h/t Rob Montoya). … Here’s a good closeup of the really awful West Virginia digital-camo baseball tops (thanks to Coleman Mullins). … The Toronto Blue Jays batting practice/spring training caps have both the Jerry Dior batterman logo AND a Blue Jays logo on them (from Justin Terry). They did the same thing last year as well (from @ron). … Tweeter RN’s Funhouse said, “Any idea what these Cubs patches were for in 1984? Google is no help. Sorry for the terrible quality.” I’m guessing those are the 1984 NL Eastern Division Champion patches. 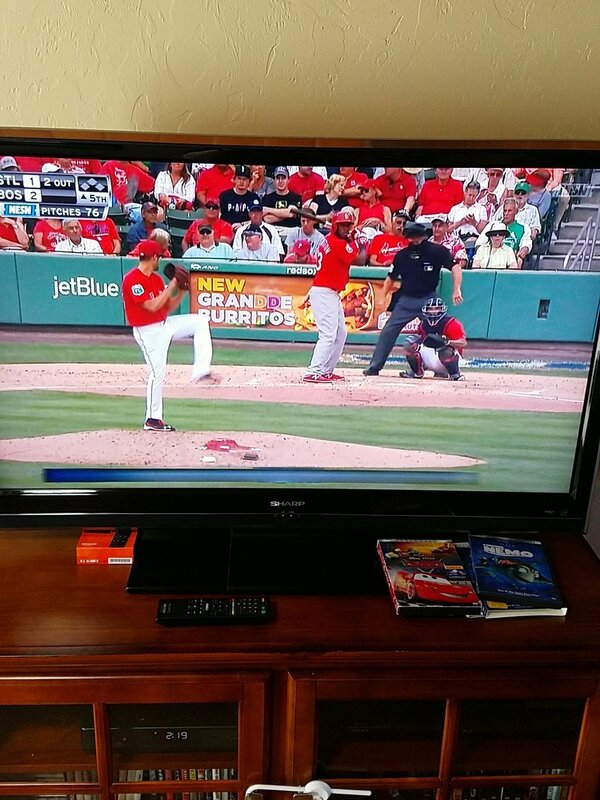 … Red Sox and Cardinals went red jersey vs. red jersey yesterday (from Richard Grossman). … “I was at the Clemson/Boston College baseball game (yester)day, and noticed that the BC players were all wearing what appeared to be two-in-one socks,” says Chip Powell. “Also noticed that many of them had pinkish ‘sanis’ as the maroon from the socks looked like it ran in the wash. This is the best pic I could get from where I was sitting.” … In college baseball, Louisville and Miami went red versus orange last night (screengrab by Adam Apatoff). NFL News: The NFL have said the League will not grant a Super Bowl to the Atlanta Falcons if the Georgia Legislature passes a bill that would “be a check on the civil rights of gay people in Georgia.” There is *sorta* precedent for this, when the NFL threatened to (and did) deny the Super Bowl to Arizona for rejecting Martin Luther King Jr. Day as a recognized holiday. The NFL also put the heat on Arizona a separate time for similar anti-gay legislation. Even if this is the right thing to do (which it is), should the NFL be able to exert this type of power? And if they can do this, why can’t they hold the threat of the loss of any future Supes to the Washington team (whose stadium is located in Maryland) for refusal to change their name? (I think we know the answer to that one anyway.) Discuss. (Thanks to Paul for the tip). College Football News: Yay! Another clickable slideshow from Bleacher Report! This one is called “10 College Football Brands That Won’t Ever Need a Redesign”, and, as you might imagine, the list is populated by schools who have had classic looks (some of them for a long time, even). … Check out this Ole Miss Football poster from 2000, showing the team was outfitted by Russell (thanks to Griffin Smith). NBA News: The Heat/Cavs game last evening was a color on color uniform matchup. Miami wore their Latin Heritage “El Heat” uniforms (thanks to Robert Hayes). … Other color on color games included the Nuggets vs. Hornets, the Knicks vs. Wizards (in their “Bullets” fauxbacks), and the Pacers vs. Thunder (thanks to Zach for all of those). … Also from Robert Hayes, the Spurs (gray) and Warriors went color vs. color. … The Sioux Falls Skyforce (a Heat affiliate) wore these really corny uniforms last night (from Kevin English). Here’s another look. College/High School Hoops News: “Cool short video/story worth a mention on the final four/ncaa logos, as well as for highlighting a neat business this guy runs out of his home (in a small “city” out in PA),” writes Chris Lewis: Meet the Man from Schuylkill County Who Designed the NCAA Logos. … The Diamond Ranch Academy Diamondbacks of Hurricane, Utah, have some interesting jerseys. Submitter Benji King notes they also have some rather intricate playing fields as well. … Yesterday KAT was watching Kentucky, sporting the new logo on the cap (via Joey Pants). … Several folks tweeted this at me: yesterday Thomas Bryant was sporting only two of three trefoil stripes. … Conrad Burry has made a 64-team bracket circle for the NCAA tourney. You can see the full circle here. Grab Bag: “This is not at all uni-related,” says David Cline, “but being a food guy, I thought you would get a kick out of this: States as Food Puns.” … Because lacing up your sneakers is so 2010s (apparently), Nike has introduced a “self lacing and self fitting shoe” that has a sensor in the heel, so as a user steps into the shoes they tighten and adjust automatically. 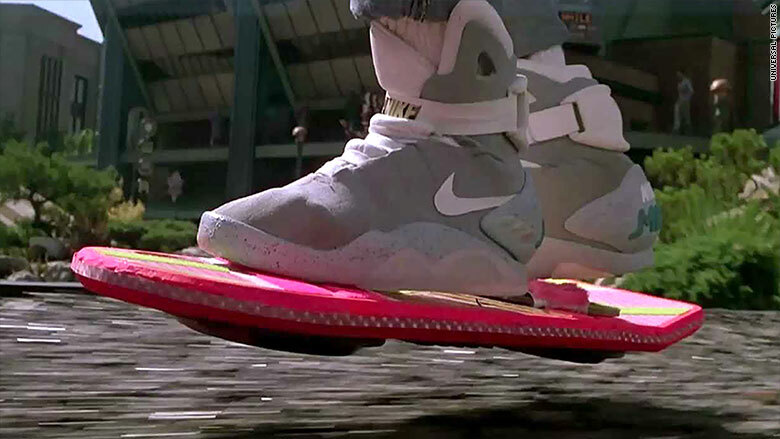 Weren’t we supposed to have this technology for those Back To The Future sneakers (and hoverboards too)? … The Japanese women’s volleyball team is going blue (including shoes), in the press release, you can see 2014 (red) and 2015 (orange) uniforms (thanks to Jeremy Brahm). … Whoa — check out these lacrosse helmets for the Binghamton Bearcats (h/t Anthony Naglieri). … Missouri is rocking some awesome tiger-striped singlets at #WrestleNYC (via Josh SÃ¡nchez). … Here is a look at every Wiz/Wizards/Sporting jersey, home & away, from 1996 thru 2016 (from @ZedMinor). … There is color versus color…and then there’s TRUE color vs. color (shot by Jay White). The NBA should be commended for going more color-on-color. There just is not a reason in the year 2016 that one team must wear a white jersey in an where a lot of the TVs are high definition. Of course there should be rules that ban navy blue vs. black, and orange vs. red, but a lot of the team colors clash clearly enough to easily differentiate which team is on which. Also, as much as those Sioux Skyforce uniforms are hideous, it makes the D-League look more like any other minor-league team, with special uniforms, its probably a good sign for the sustainability of the league itself. The reason not to do color versus color: because it looks awful. That’s reason enough. Sez you. I think it’s safe to say that you are in a very small minority around here. 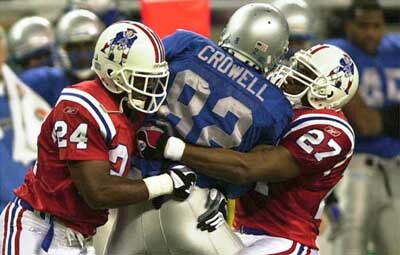 Other than baseball, the only reason teams created alternate color jerseys is because of television…. and the fact that black and white TVs made it hard to tell the teams apart. Same reason the red line in hockey is either dashed or has some pattern in it nowadays; so that you could distinguish it from the blue lines. With today’s TV technology, there’s no reason to require one team to wear white. To be honest, some whites are better (Red Wings, for example) than the colors. Scott is right. For a blog where followers claim to adhere to standards of “aesthetics”, so many of you have terrible taste. Google the term “eyesore”. It tends to occur when two colors clash with each other. There is science behind this – see the artist’s color wheel (which Paul Lukas has dismissed on this blog). Color vs. color sometimes works, but only when one color is very light and the other is dark. This is known as “contrast”. Like when UNC wore Carolina blue versus USC wearing dark maroon. That was fine. Similar to USC vs. UCLA. So save color vs. color for special occasions, because most of the time it makes the game literally painful to watch AND makes it hard for colorblind people to tell the teams apart. So it’s kind of inconsiderate to pine for it so much. It only looks awful because it’s different from what you’re used to. I agree, it’s great the NBA is finally realizing it’s 2016 and everyone has HDTV. Now if we can just get the NFL to follow, without going with stupid monochrome uniforms in the process. I’m wont to agree with THE here (damn you planet misalignment). But even if color v. color games don’t “clash” that doesn’t mean they will look good. However, there are some games that look so damn good in color v. color that it completely justifies its mere existence. Also: if the NFL wants to turn off viewers to color v. color games, forcing color rash is a great way to do it. color v. color is much more effective when teams DON’T go monochrome. Kudos and thanks to David Cline on those state/food puns. I was prepared to be disappointed but they were clever and high quality pics. Now I’m “Hungary”. Get it? George, rest assured that we will never lose interest in your coloriizations. Ticker / Grab Bag: It’s either Mizzou or Missouri, but never Mizzouri. Was hoping the TRUE color vs. color link was going to be a Cyndi Lauper themed uni night. As someone who was born in Pittsburgh in 1977 I can’t agree more that the bumblebees are indeed the signature look for the Pittsburgh Pirates. Every white and gray uniform they’ve had since has bored me to tears. Are the bumblebee jerseys the signature look? What is the most iconic photo in Pirate History? That photo CO Tain’s the most signature Pirate uniform. Good question … I’m thinking this one might be up there…but there are probably dozens that would be up for debate. There’s no “P” in Binghamton. Yet it is so frequently misspelled with one. And it is usually pronounced “Bingum-ton”, not “Bing-hampton” (ie., “Northampton”, “The Hamptons”, etc. ) so it isn’t like there is an audio cue to include the P. Just a curious thing to me. The NFL is doing everything right here, and in completely the right way. I honestly don’t see room for a debate here, even though the Ticker invited some debate. Likewise, teams like the White Sox and Indians have worn their current sets (or close variations) so long that younger fans have no clear memory of wide-collar jerseys and shorts and red cavemen tops. So to them, a black White Sox top or the script Indians wordmark are signature looks. Absolutely — did you see the “most iconic photo” I posted above? That’s the first photo I think of — and clearly the sleeveless jerseys (vests) was a look that would, under any other circumstance, qualify for a “signature” look for the Buccos. But I think the Mustards also meet that standard, and then the bumblebees smashed both of those. Just my $.02, of course. And yes, a “signature” look may vary by generation. I barely remember the Pirate vests of the 50s/60s, but it’s still iconic to me. Most people will (most?) remember unis they saw, but that doesn’t preclude a discussion of all unis a team wore when discussing a signature look. The signature look is probably in the eyes of the beholder, and I’m so glad the Pirates have experimented with different looks, even if all the choices didn’t pan out. I like the fact either the world championship teams and/or great players have had a different look. This is more of a generational question, it’s likely the under age 30 Pirates fans would choose the current set, since that represents the resurrection of a historically successful franchise. I’m 30. I’ve never considered the “We Are Family” uniform as the Pirates signature look. I don’t think the modern jerseys are their signature look. For me, it’s the vest jerseys that are the Pirates signature. I’ve even got a t-shirt with the Mazeroski picture on it that I got at a sports store in Pittsburgh years ago. The lede of today’s entry- if your are doing a pun on “What’s your sign?”, shouldn’t it read”What’s your sign(ature)? I considered that. Also considered going with What’s Your “Sign”ature, with quotes instead of parens. Ultimately, I thought Sig(nature) was better when spoken as Sign(ature) might be read aloud as “sighn – a-ture” rather than sigg-nah-turre. Good point though. It’s not as punny this way, but I think it reads (if spoken) better. Re: Nike’s ‘self-lacing and self-fitting’ shoes, this is not the only mention I’ve observed that diminishes the accomplishment. Al Roker noted ‘lazy Americans’ on the Today Show after a news item about them. I think it’s important to note that Michael J. Fox remarked when Nike presented a pair of “Back to the Future” self-lacing shoes how incredible this technology would be for people suffering from muscular deficits, e.g. Parkinson’s disease, stroke victims, etc. I don’t know if any of that was presented by Nike when they announced the shoe, or cost, or availability. Man, it’s great to see all those Bucco’s unis in one post. Great lede today! Can’t wait to see those throwbacks on the field. The signature Pirate uni is the 1960s era with black sleeves. It always will be the signature Pirates look. George C some of us are always interested in colorizations. I know they are in the slower weekend days. And most of the time nobody even acknowledges them. But please share for those who really enjoy them. That example is for the Yankees only. They must have talked Majestic out of it, I don’t know for sure how this was arranged, as all the other teams have them. $391.00 for a customized pro-weight baseball jersey!?! Holy crap. If there were ever a post that begged for a comment from Mr. Reuss, this is it…hope he chimes in. My first real memory of baseball is from the early 70s and I think the mustard look is the Prates signature look. There are so many bumblebee combinations, it is more than one look. The mustard uniform started the double-knit era and revolutionized baseball uniforms. Clemente owned the 1971 World Series in this look. In regards to the self lacing sneakers one of my college friends, who had a stoke at birth, remarked on how great these shoes will be for people with disabilities. Once again I’ll be the outlier I guess. As a lifelong Pirates fan who will be 40 in a few months I HATE the bumblebee era look even with that being the first memories I have of the team. The bumblebees are dreadful and the mustard era before that is even worse. The late 90’s with the black gold, and red alt is my favorite look although I hated the solid gray hat on the road with the pinstripes. I wish they either added the pinstripes to the hat like the Reds did at home or drop the pins on the road. The 91-96 and current home, road, black alt are also favorites of mine. The current set gets dropped to 3rd instead of second only because they insist on doing a cammo jersey now and also insist on those horrid Sunday throwbacks. Drop those two, make the current black alt the home alt and add a 2nd gray or black alt with the 90’s cursive “Pittsburgh” replacing the “P” and this set may jump up to being my favorite.